After a losing streak which cost Dortmund the lead in the Bundesliga and also the advance to the next round in the Champions League, Dortmund finally, what some fans might say, sacked Peter Bosz last week after they lost to Werder Bremen. Now Peter Stöger who got sacked a week before at Cologne is in charge of Dortmund until the end of the season. His first game as BVB coach was quite successful. They won under the week against Mainz 05, and could finally celebrate a victory after that horrific losing streak. Last weekend Stöger made is home debut against Hoffenheim. Their coach, Julian Nagelsmann, is one of the hottest candidates to replace Stöger at the end of the season. However, this time Stöger´s team could get the win and now is going into the winter break at third place in the Bundesliga table. Peter Stöger didn’t change anything compared to the victory against Mainz. Again, they used a 4-3-3 formation with the technical strong midfield of Weigl, Guerreiro and Kagawa. They supported the offensive trio of Aubameyang, the central striker, Pulisic who played on the left side but pushed inwards quite often and the wider positioned Yarmolenko on the right side. To help the struggling defence Stöger uses a back-four which doesn´t push that high. Toprak and Sokratis played as centre backs while Toljan again started at right back. Captain Schmelzer played on the left side while Roman Bürki was Dortmund’s goalkeeper for that top-game of the week. Julian Nagelsmann lined-up his team in his preferred 5-3-2 with two versatile strikers in Mark Uth and Serge Gnabry. Behind both strikers, Hoffenheim had three players who are good under pressure and can find solutions quickly. Nadiem Amiri and Kerem Demirbay played higher up the pitch supporting the offence while Grillitsch was in charge of the position in front of the defence. Zuber and Kaderabek filled the winger position alone and got rarely supported by Uth and Gnabry who pushed out of the centre and attack through the wing. The back-three in front of Goalkeeper Baumann was very good in playing out from the back which was crucial to Hoffenheim´s approach against a passive Dortmund side. Vogt, Posch and Hübner all can build-up the game through flat accurate passes and are all calm under pressure. Under Peter Bosz Borussia Dortmund was the team who had a lot of possession and tried to control the game through that. The defensive line normally pushed very high while the midfielders tried to form numerical superiority in certain spaces. Especially the high defensive line respectively the inability of Dortmund’s defenders to play so high was one of the main problems of Peter Bosz which he couldn’t solve until the end. Peter Stögers first changes were related to those weaknesses. Under Peter Stöger the defensive line is positioned deeper while the full-backs keep more their position instead of pushing high to provide a wide passing option in the offence. Furthermore, Stöger concentrates more on fast vertical combinations and counter attacks and doesn’t want to control the game full cost. Against Hoffenheim, they positioned in a 4-3-3/4-5-1 defensively and letting Hoffenheim build-up calmly in the first line. Aubameyang rarely applied much pressure against Hoffenheim’s back-three. Moreover, he tried to cut the passing lines to Grillitsch. However, he hadn’t so much responsibility in the defensive work. Behind Aubameyang Dortmund created a five-man line. Pulisic and Yarmolenko should concentrate on closing the passing lines to the wingbacks and making the centre as compact as possible. Normally they positioned between Hoffenheim´s central midfielders and their wingbacks. But, especially Yarmolenko showed his weaknesses in defending and quite often gambled more by staying higher to be in good position for counter attacks instead of fulfilling his defensive tasks. This opened space for Hoffenheim´s Zuber on the left side. Vogt has time on the ball, due to Hoffenheim’s 3vs1 or 4vs2 majority Dortmund cannot press them. Yarmolenko is positioned a few meters too high. He tries to anticipate a pass to Hübner and pushes even more out of position, consequently Vogt can find Zuber on the left side from where Hoffenheim can advance into the space between the defence and the midfield. As I mentioned, Dortmund played more passively and tried to stay compact to avoid passes between the lines. 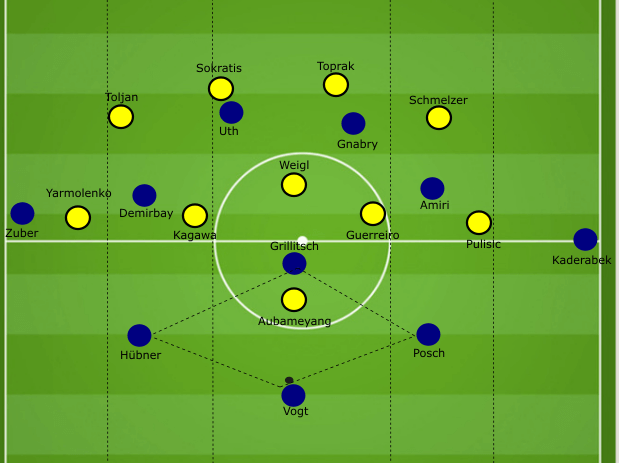 Compared to the time under Bosz, Dortmund´s lines were positioned closer together against Hoffenheim which made the defensive shape more compact. However, Dortmund´s passive approach gave Hoffenheim the opportunity to build-up from behind without any pressure. Their centre backs circulated the ball quickly trying to move Dortmund´s defensive shape and open passing lines to their central midfielders Amiri and Demirbay. Both central midfielders rarely positioned on the wing to support Kaderabek and Zuber rather they occupied the halfspace by moving between the winger and the central midfielder of Dortmund. The position of Amiri and Demirbay was crucial because when they stay too central they would cut the passing lines to Gnabry and Uth. Julian Nagelsmann regularly concentrates on creating a structure which provides the maximum of passing option for each player. Maybe you could interpret that he got influenced by Guardiola’s positional play. Because at Hoffenheim, it is also the case that normally no more than two players are positioned in the half-space while the wing often just got occupied by one player. The picture shows Hoffenheim’s structure in possession against Dortmund´s 4-5-1. In the first line, they used a diamond to safely build up. Demirbay and Amiri are occupying the halfspace while Uth and Gnabry move horizontally between the lines, normally staying in the centre. Because of that structure, the centre backs can reach all offensive players through vertical flat passes. After the goal scored by Mark Uth, Dortmund started to press higher to interrupt Hoffenheim’s build-up by pressing Hoffenheim´s half-backs with Kagawa and Guerreiro. Due to the deeper position of Dortmund´s defensive block before, Hoffenheim was able to advance through their half-backs (Posch and Hübner) and their number six, Grillitsch, in the centre. Especially on the left side, they created overloads and dangerous structures to use the play over the third man. So, they were successful in drawing Dortmund out of position, Dortmund had to apply pressure on the advancing half-backs, who then exploit the open spaces and therefore breaking the midfield line. Those problems/combinations appeared right before Hoffenheim´s goal. Hoffenheim could advance into the ten-space through a combination over the third man and then switch the play to the other half-space where Amirir could find Kaderabek behind the lines who crossed to Uth. Hoffenheim uses his superiority in the build-up to open space for their half-backs. Through a pass to Grillitsch, Hübner draws Kagawa and Guerreiro out of position. When Hübner receives the ball back, Kagawa continues pressing. That creates spaces for Hoffenheim, especially for Grillitsch. Through their good structure, Hoffenheim advances into the space between the lines. Look at the space Amiri who receives the ball after that combination has. Also Posch and Hübner, Hoffenheim´s half-backs get a lot of space which they used often. Dortmund focused more on getting dangerous attacking options through counter attacks. The main objective was to win the ball in midfield due to their compact shape and then attack quickly with flat vertical passes. Most of those attacks went through the wing and then diagonal in the centre. When Dortmund couldn’t play quickly in the box they build-up from behind with five players. The centre-backs positioned wider but were connected all the time. Especially because the full-backs stayed deeper and supported the offensive game lately and without using overlapping runs. Additionally, Julian Weigl supported the build-up. Against Mainz and Hoffenheim he had a deeper role which resembles the role under Thomas Tuchel. In this deeper role, Weigl could use his strengths better. He is great in organising the build-up and offering passing options between or behind Hoffenheim´s first defensive line with Uth and Gnabry. Here, for instance, he shows his great awareness of structure and space. Schmelzer has no passing option despite Pulisic who easily could get doubled. Therefore, Weigl moves forward out of the cover shadow of Gnabry and Schmelzer can bypass two players of Hoffenheim when he passes to Weigl. Dortmund’s deeper full-backs had troubling effects on the transition between build-up and attacking play. 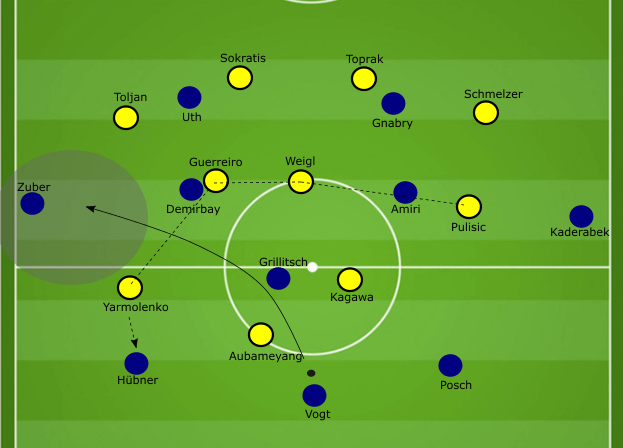 Due to the deeper role, Pulisic and Yarmolenko had to stay wider to stretch Hoffenheim’s defence, however, then Hoffenheim could easily control the centre because they had a numerical superiority. The central midfielders Kagawa and Guerreiro got doubled and therefore didn’t really participate in the game in for Hoffenheim dangerous spaces. Furthermore, Pulisic and Yarmolenko got isolated at the wing and Hoffenheim could avoid them the space to dribble inwards. Hoffenheim had a 6v3 majority in the centre. Therefore, they could double Kagawa and Guerreiro. Also, Demirbay and Amiri could push out of that block to press without allowing Dortmund to much space in the centre. Dortmund’s chances in the first half were mainly due to mistakes of Hoffenheim. For example, Yarmolenko´s first chance resulted from a bad pass of Grillitsch to Vogt which the Ukrainian could intercept. The other opportunities mostly came from quick vertical combinations following an interception in midfield. After the break, Dortmund looked far more dominant and tried to create more chances through a solid build-up from behind. The full-backs pushed a bit higher, however, the game started to change after Dortmund equalised with a penalty after they were able to combine into the box with a quick combination. The second half hadn’t much to offer in terms of chances and creative offensive game. The speed of the game was low after Stöger brought Dahoud for Yarmolenko, Dortmund had a higher presence in the centre because Kagawa who now was in charge of the right wing, focused more on positioning between the lines, so Dortmund had more players between Hoffenheim´s defence and their midfield line. When all was set, and it seemed that the teams agreed on a draw, a blitz of the magic of Christian Pulisic helped Dortmund to secure the win at home. It was interesting to see what Peter Stöger was going to change. The game against Mainz showed the first changes in Dortmund’s approach. Stögers main focus in the first days at Dortmund is the defensive stability and the return to a more vertical focused offensive game. The game against Hoffenheim could also be a sneak preview of Wednesday’s big clash in the German DFB-Pokal against Bayern München. You can expect that Dortmund will focus on creating chances with counter attacks while being compact on the defensive end. It will be interesting to see how Bayern will deal with a counter-attacking Dortmund team.